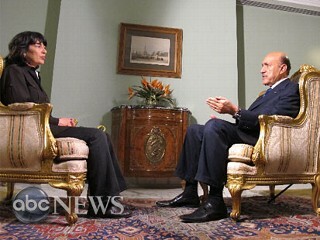 Egypt's Vice President Omar Suleiman sits with ABC News' Christiane Amanpour. In his first interview since becoming Egypt's newly appointed vice president, Omar Suleiman agreed to sit down with me at the Presidential Palace today. I did so just after speaking with President Mubarak. Until today, Sulieman had not agreed to do any interviews. Today, he went on Egyptian state television and then sat down with for an exclusive interview with me - the first interview he has agreed to do with foreign media. I asked Suleiman for his take on the conversation he had with the Obama administration about Mubarak's resignation. "My telephone call with Clinton," he said. "We discussed this issue but she didn't ask that President Mubarak step down now. But I told her it was a process, and at the end of it, President Mubarak will leave." Suleiman added that he would also not seek re-election as well. When I asked him if he felt that the United States has betrayed his president, Suleiman didn't give much of an impression either way. "What I hear from President Obama is that he is supporting the people," he said. "President Obama told our president that he is a brave man." Last week, in Tunisia, crowds staging similar protests ultimately caused the longtime leader of that country to flee with his family. Vice President Suleiman vowed that this is not what will happen here. Sulieman said Mubarak has no intention of leaving his country. "No, Egypt will not be anything like Tunisia," he said. "This is different. You know that our president is a fighter. He lived on this soil and he will die on this soil." I asked Suleiman if Egypt, a country that has had very strong relations with Israel, would remain a strong ally of Israel, and uphold their peace agreement. "Yes we will have a peace agreement," he said. "We will keep it firmly and not violate it at all." When I asked him about the pro-Mubarak mob that had attacked the anti-government demonstrators, he echoed what President Mubarak has said to me. "It's a bad thing to see and we've never had this before," he said. "Emotionally they went to the streets to express their feelings to our president. And we don't know why they went to Tahrir Square." Egypt's foreign ministry has said that the protests are a result of a foreign conspiracy against the Egyptian government, but Suleiman said something different. "I believe that they are from our society," he said. "They are not foreigners, but for sure, these people have been supported by foreigners." Suleiman also denied that no one, protesters or otherwise, had been killed by "rifles or snipers." He defended Mubarak's supporters. "The pro-Mubarak group behaved very well," he said. "Yes, we have to apologize to the young people. But at the same time, we have to know exactly who is behind that." But again, Suleiman repeated what Egyptian army officials said on State TV a few days ago, that the government will not use their army against it's own people, even in heated moments. "We will not use any violence against them," he said. "We will ask them to go home but we will not push them to go home." Accused of ignoring the demands of the anti-Mubarak protesters, Suleiman said Mubarak's speech on Tuesday was their attempt to "positively" respond to their demands. "This is the only thing we can offer because the time is limited," he said. "We have only 210 days until the presidential election. And we cannot do more than that. We will reform the constitution, which will take more than three months." Suleiman said that he believed only a small segment of Egyptians would like to see President Mubarak depart immediately. There are very few people saying that," he said. "It goes against our culture. We always respect our president, respect our father, respect the guy who's done well for his country as president Mubarak has done." In a country that depends on tourism, Suleiman pointed out that these protests have severely hurt Egypt's people and the country's economy. It's estimated that about one million tourists have fled Cairo since the protests began on Jan. 25. "[Our people] want to express to the others in Tahrir Square that now we have no work," he said. "I hope they will recognize that they are not doing well to the country."